Learn how to ride like a freestyle pro, and have a fantastic time, too, with a Ski or Snowboard Camp! Whether you’re young or old, a skier or snowboarder, a freestyle camp is the way to improve your skills and have fun on the slopes. Camps are available for all ages and abilities, and can include a variety of amenities and accommodations or just freestyle coaching. LUEX has the perfect freestyle trip for you! If you want to have an awesome ski or snowboard holiday and improve your skills, too, a freestyle camp is the way to do it. If you’ve always wanted to learn new tricks or perfect your turns, but just haven’t had the time or the right instruction, a freestyle camp can get you to where you want to be. 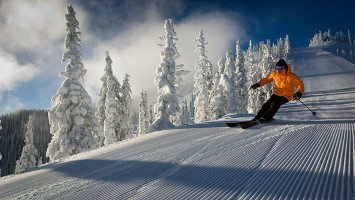 With the help of an experienced teacher, you can learn everything you need to know, for whatever type of skier or snowboarder you’d like to be. Whether you want to learn how to get some serious air, or how to ride a rail like a pro, LUEX can help you find the ski or snowboard freestyle camp that has everything you need. At the end of your freestyle camp you will leave with new skills and tips for how to continue improving your skills, but the most important thing the camp will give you is the motivation to get out there and ski or ride. Freestyle camps come in all shapes and sizes. LUEX can help you find a camp that is perfect for what you need, whether you are a skier or snowboarder, a beginner or advanced rider, group or individual, and much more. Typical freestyle and snowboard camps are all-inclusive, multi-night trips where you’ll shred all day, and hang out all afternoon and evening with a bunch of other riders. Freestyle camps are much more than just a way to improve your skills, they’re also a great way to socialize and meet new friends. The typical freestyle camps usually include coaching, lodging, food, and more. If you want a hassle-free trip with nothing to worry about, this is the perfect type of camp for you. LUEX can also arrange the perfect package for individual travelers or groups who are looking for something special. These packages would include freestyle coaching, and accommodation suited to different budgets. In addition, LUEX can help to find a trip with full flexibility on arrival/departure time and with the freedom to choose your own lodging. Because this type of camp does not involve staying with other campers 24/7, these camps are very well suited to groups, or solo travelers who are not interested in the all-day camp atmosphere. Summer Camps are perfect for school breaks or for anyone who wants to enjoy the soft snow and abundant sunshine of the summer months. These camps are also often the best way to improve your level because of the summer snow which makes for softer landings and perfectly prepared parks. During the summer months, the parks are peppered with pros from all over the world, making the camp experience one that you’ll never forget! You’ll have a great time riding or skiing every morning during a summer camp, but you’ll have just as much fun doing the afternoon programs which feature awesome sports and activities like downhill mountain biking, skating, golfing, swimming, and much more. A summer camp is a great way to learn and have the time of your life, too! 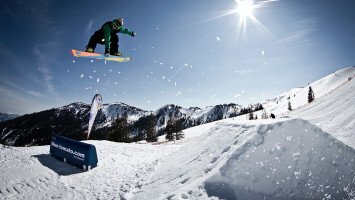 You’ll find the biggest freestyle camps in the world in parts of the United States, where young freestyle addicts grow up to be pro skiers and snowboarders. 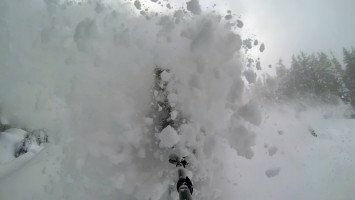 Canada hosts some incredible playgrounds as well. 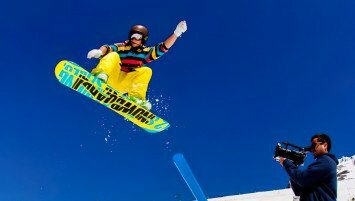 But also in the Alps there are a variety of freestyle camps available with world class parks and amazing features. You’ll also find fantastic training facilities to boost your skills on and off the slopes, like the Freestyle Academy in Laax. In the Alps, the freestyle camps are growing and improving everywhere, so there’s sure to be something you’ll love. During northern hemisphere summer, head to the southern hemisphere to enjoy real winter conditions! Countries like New Zealand and Argentina offer amazing freestyle camps for skiers and riders of all levels. Are you ready to rock? And ride? Let the LUEX travel experts help you plan the perfect freestyle trip. We have options available for everyone. Whether you are a parent looking for a camp with 24/7 supervision for your young children, or you’re a grown up kid who wants to go to camp and play all day, we can help you to find YOUR perfect freestyle camp. Let us know what you’re looking for, and let LUEX do the rest!